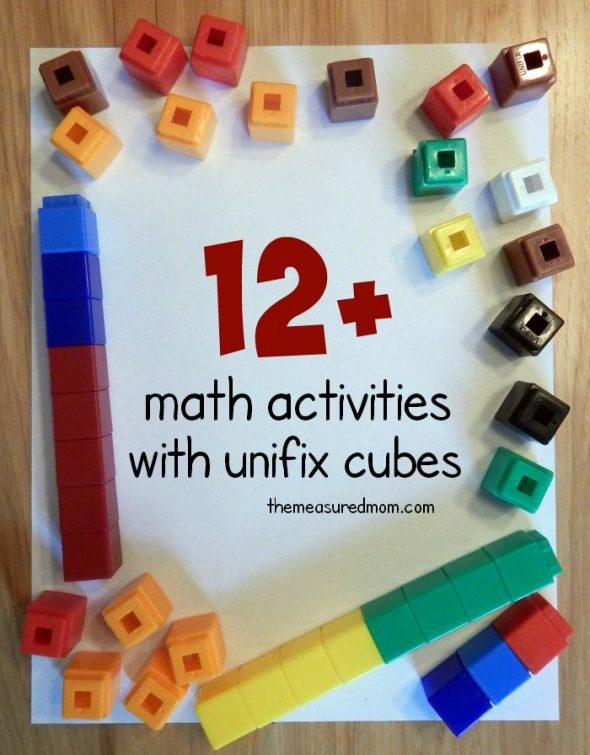 Today I’m sharing a variety of activities to help you get the most out of your unifix cubes. 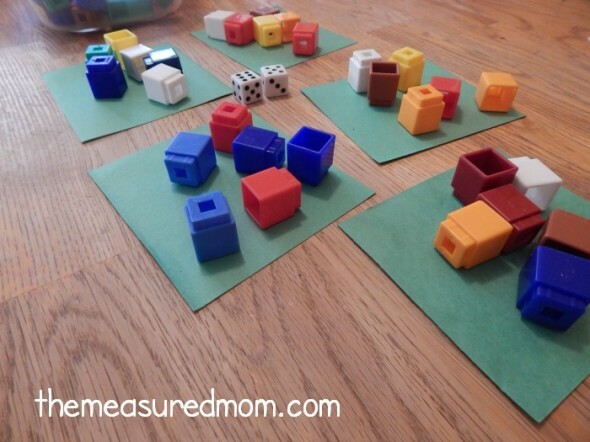 We have a small set of unifix cubes that we use for all sorts of math learning. 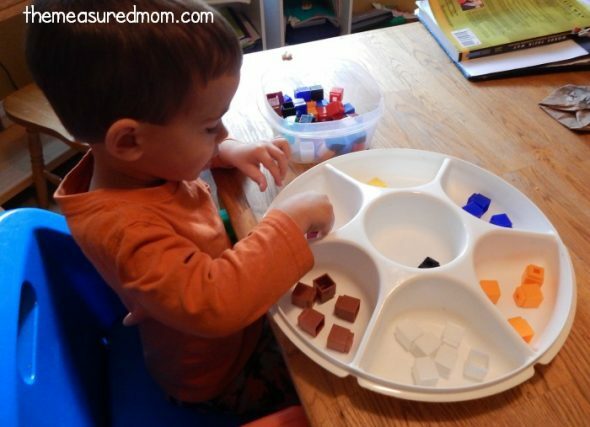 Today I’m sharing some ways that kids ages 2-8 can learn with these colorful manipulatives! There are ten different colors in our set of unifix cubes, so my dip tray didn’t have quite enough sections. But no matter… sorting 100 cubes (minus the 20 or so we’ve misplaced, ahem) is a big job – so my Two sorted about 7 colors before he’d had enough. This looked so fun my Four wanted a turn afterward. My Two (going on three) is now counting past ten quite well and starting to count objects up to 5 without difficulty. The next step? Learning to recognize numbers. So I took one of our cool blank dice and labeled the sides with some small numbers to start (1, 2, 3, 1, 2, 3). When he rolled it I helped him identify the number. Then we added that number of cubes to his tower. This idea from Prekinders was perfect for my Two. I printed some of these more/less/same cards. Then I placed down two cards at a time – of two different colors. My Two placed cubes on the squares as we counted together. Then we built the towers to see which was taller. 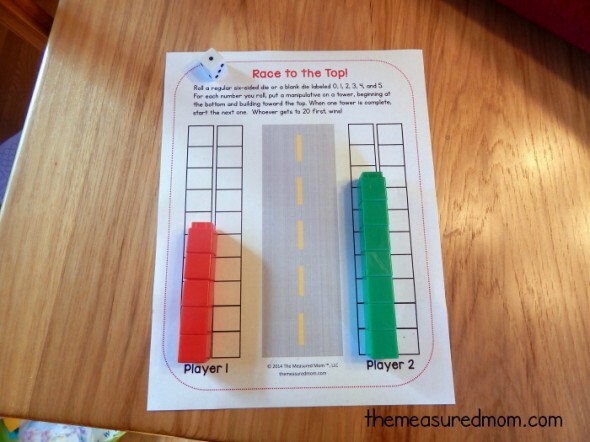 Older kids would be able to tell you which amount was more without building the towers; building the towers and comparing them would be a way to check their answer. We have found a lot of fun ways to make graphs. This is another one to add to our list. I simply gave my son the printable, crayons, and a set of cubes in eight colors. 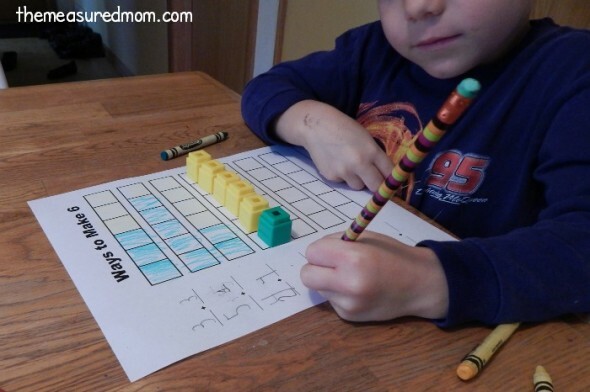 He used some crayons to color a square at the bottom of each column to represent the colors. Then he graphed them and compared the towers. Get your printable graph here. These free unifix cube pattern cards from Heidisongs are terrific! I love the set includes a huge variety of patterns. My Four started simple with ABAB and moved into the tougher patterns. We began the pattern by placing cubes on the colored squares. Then we named the pattern (yellow, blue, blue, yellow, blue, blue) and he continued it. A year ago patterns made no sense to him at all, and now they’re a breeze. Yay! Your child might be able to label the pattern (ABCD or AABB, for example), but my Four isn’t ready for that. 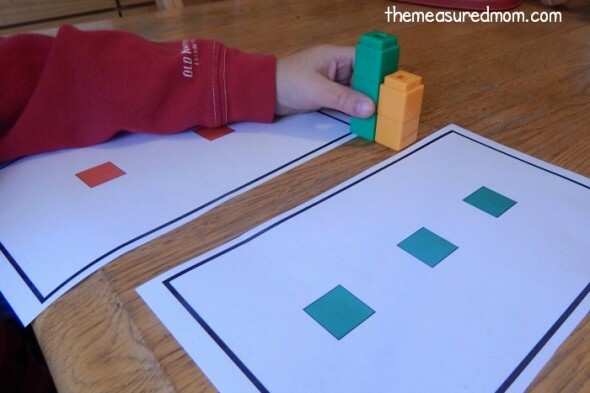 For an even more advanced pattern activity using unifix cubes, visit Stay at Home Educator. I printed these free addition flash cards from 3 Dinosaurs and cut them apart. When I set out a card, my Four modeled the addition fact using two different colors of unifix cubes. Then he was allowed to write the answer on a stack of sticky notes using a permanent marker (the marker was the big attraction). I love that you can get free printables for ways to make 7, 8, 9, and 10 in the same free pack. I created this simple printable to work on a variety of skills with my Four. We took turns rolling a die and building onto our towers until one of us had a total of 20 cubes. You can get Race to 10, 20, or 30 by visiting this post. My Four was excited to practice writing his numbers using permanent markers on post-it notes (two things he does not usually get to use). After making sure the post-it notes were on a newspaper as he wrote (so as not to mark up our table!) he had fun writing his numbers up to 20. For this activity, we used just numbers 1-10. I made the towers, he counted them, and put them in their proper spots. You could also have your child make the towers. 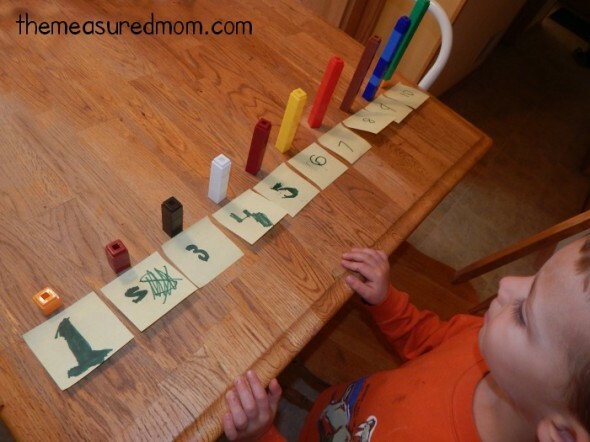 We were inspired by this block activity from Frugal Fun For Boys. After their day at kindergarten and second grade, I gave a copy of this printable to each of my two oldest. They enjoyed making estimates and checking their guesses by making unifix cube towers. Get your free printable HERE. 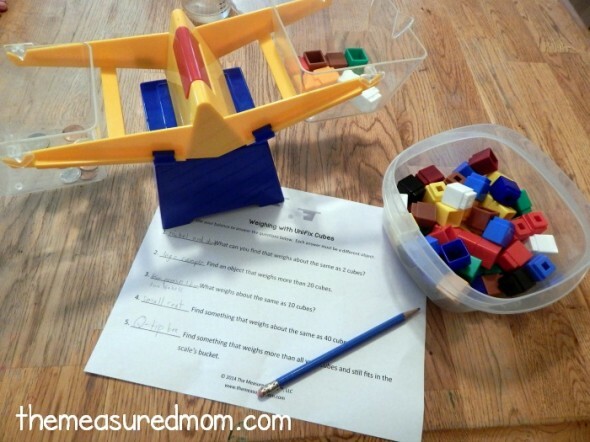 We used our balance so my oldest two could get a little more measuring practice. 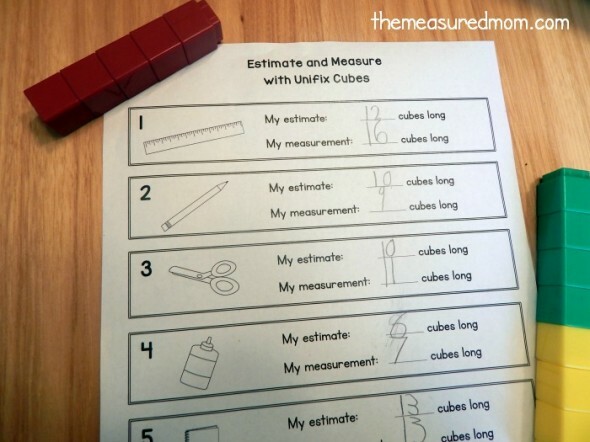 They found objects that weighed the same, less, or more than a certain amount of cubes and recording them on the worksheet. Get your free printable HERE. The other evening, after he was supposed to be asleep, my Six came down the stairs very upset because his sister had told him that five times three equals fifteen. He was sure it had be eleven, and no matter what I said he wasn’t convinced. My attempts to teach him the basics of multiplication were lost on him, so I pulled this activity out a few days later. To make it a game, I pulled out two dice and a set of six construction paper squares. The first die he rolled told us how many squares to set out. The second die told us how many cubes to put on each square. I showed him how having sets of a particular number is what multiplication is all about. We counted the cubes and wrote the multiplication facts. The Hawk’s Nest used cubes to explore the commutative property. 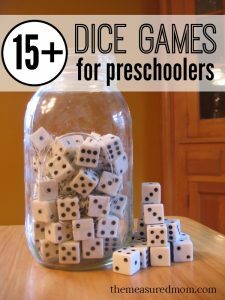 Have you seen our ways to learn with dice? 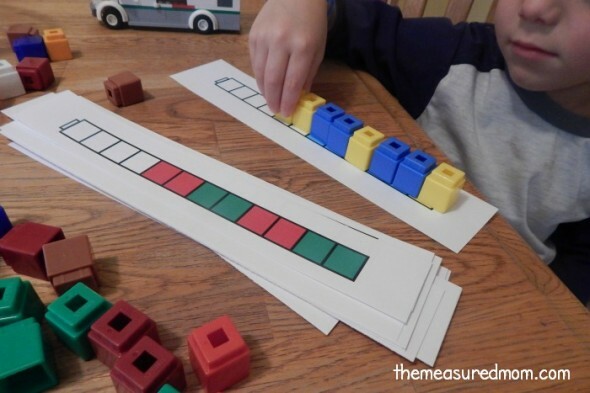 Another great manipulative! Take a peek at some of our other resoures! © 2014 – 2017, Anna G. All rights reserved. Great list of ideas! I will be using some with my grandson, Gus…thank you! I also have blank dice that are large…about 6 inch by 6 inch. They have pieces of white board on each side within a plastic frame. I use dry erase board markers to write on them. 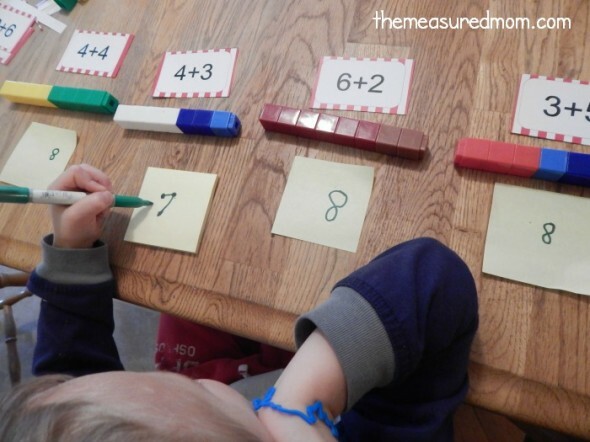 I can put just numbers or write math problems on them when doing math. I can also use them to do literacy games, such as roll one die for a starting letter and the second for a word ending, ie: Gus rolled a ‘p’ on the first die and ‘-an’ on the second to make the word ‘pan’. I like that idea for making words, Peggy! I’ll have to look into finding some bigger blank cubes. Thanks for sharing! i found some at dollar tree recently in the teacher section. I use them for math and reading where i put letters or sight words on them. Wow, that’s a great Dollar Tree find – I’ll have to keep my eyes open for them! Hello! Love these ideas!! Thank you. The link under the estimate/actual sheet where you measure the objects with the cubes isn’t there. Can you add it, I’d love to print it! 😉 Thank you for all your hard work! Thanks for the heads up, Lesley – it’s there now! i am loving this website and all of your wonderful ideas!! As a mother of 4 (10, 8, 3 and 11 months) and a primary school teacher here in Ireland who teaches Junior infants (4/5 year olds) I am constantly finding things here that I am able to put into use in my classroom and with my 3 year old almost instantly, a quick print off and we are ready to go!! I’m so glad you can find things quickly and easily here, Olive! One of my big goals is to save teachers and parents time and energy. Thanks so much for following along! I just got our Unifix Cubes and these ideas will give us a great start on how to maximize them. Thanks for sharing these activities. This was such a great post. 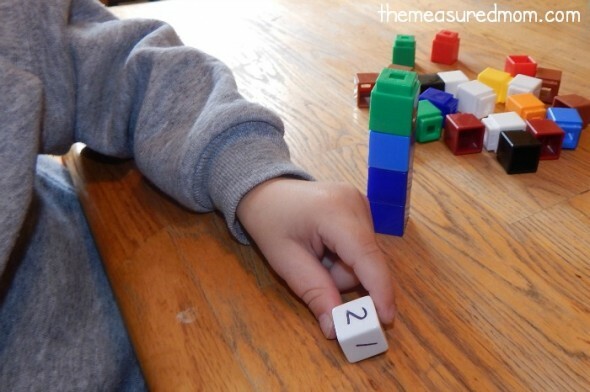 My 4yo is right at this stage of learning numbers and counting. I went a bought some unifix cubes and did not know how I was going to help her use them. Thank you for all the ideas! You’re welcome, Caris – I hope you have fun with them! May I know how to purchase the unifix cubes set and how much does it cost? Hello, Victoria! Right near the top of the post you’ll see the words “unifix cubes” in brown. Click on them and you’ll get to where you can purchase on Amazon if you’d like. You’re very welcome, Angie – thanks for checking them out! 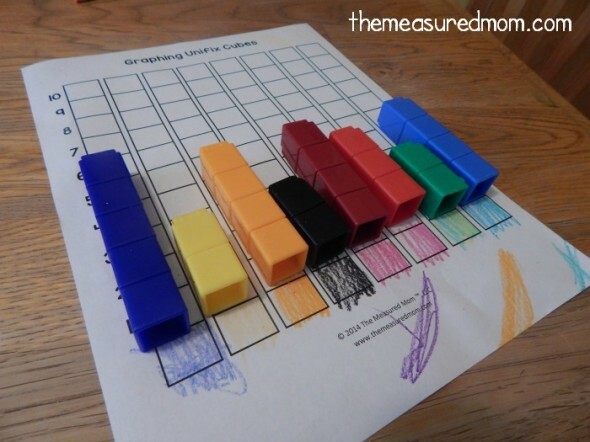 Thanks a lot, I’ll be usign lot of your bear counting graph printables pages and graphing unifix cubes for my pre-k class, thank a lot !!!!!!!!!!!!! You’re very welcome, Yanay – thanks so much for visiting! Hi I love your sheets on ways to make 6-10 with the unifix cubes . I have tried to click on to the link but cannot download them and would love to use them in my math centers. Hi Gloria – I linked to those on a different blog, so you’d need to leave a comment on their blog to ask for help with downloading. Oh, bummer! Thanks for the heads up!